Looking at this object, which is situated in a field along Memorial Drive in Cambridge, MA, many people ask, “What is it?” Some think it is some new form of satellite dish or radio transmitter. It does have the parabolic shape and shares a number of other features with a satellite dish. This contraption is actually a prototype 2-axis concentrating solar thermal collector built out of a design project class at MIT in 2004, next to my old office. Oops, two solar thermal projects so close together that I got them confused. Now I’ll need to figure out what happened to the students from the picture above. For now, take a look at the awesome work STG International is doing with providing rural electricity and local economy growth. The project discussed below was actually setup in the parking lot on Vassar Street less than a block from my office. The goal of a prototype and a design project is to learn from actually building something and you can see the actual versions deployed in Lesotho have changed greatly. Two key differences are that it is now single axis and instead of the coil at the focal point, the are using a simpler and more rugged single pipe. 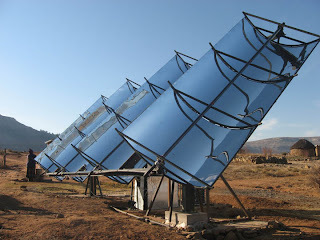 What I love about these concentrating solar thermal setups is that they no only generate hot water, but also electricity through a Solar Organic Rankine Cycle. The electricity is actually the goal and the hot water for heating and washing is a bonus. Check out Solar ORC: How it works for a great picture and details on the process of collecting heat from the sun and turning that into electricity and hot water. The projects also are designed to be affordable and use locally available skills, labor and materials so that the communities can maintained and repair them for the long term. I recently reconnected with one of the now graduated students from the original project at the MIT Clean Energy Prize Award Ceremony and Innovation Showcase a few weeks ago and was really excited to see the work had continued and grown with real world installations. They’ve built one 1 kW Solar ORC Prototype and two 3 kW Solar ORC Demonstration projects listed on their Current Field Sites. I really love this project and hope you will go check out STG International and learn more about Solar OCR. Previous Post: Getting the Slugs Out – Naturally!